Swim in summer - walk in winter and do yoga all year round! The book is really an Introduction to Contemporary Religious Philosophy, and, is a helpful guide to the students. The modern relevance of Advaitism has been given its rightful claim in the book. It is a ripened fruit of the preoccupation of the author with religious philosophy for more than fifty years. Preface, to the Second Edition, 1. Definition of Religion, 2. Religion and Other Disciplines, 3. Metaphysical Theories of Religion, 4. Foundation of Religious Belief, 5. Religious knowledge and language, 6. A General View of Religion and Language, 7. Proofs for the Existence of God: The Ontological Argument, 8. Cosmological Argument, 9. Teleological Argument, 10. The Argument from Religious Experience, 11. The moral Argument for the Existence of God, 12. The philosophy of theism: The Attributes of God, 13. The problem of evil, 14. The problem of Immortality, 15. The encounter of Religions, index. Dr. Masih, Ph.D. (Edinburgh), D.Litt. (Patna) was born on March 1. 1916.. He retired in 1978 from his post of a Professor of Magadh University. He remained a UGC Teacher of Philosophy from 1978 to 1983. 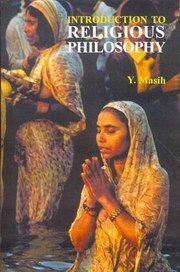 Dr Masih has devoted his life in conducting and guiding research work in Philosophy. He Important books are : Freudianism and Religion, The Hindu Religious Philosophy, The Classical Religious Philosophy of the Indus, Shankara’s Universal Philosophy of Religion, Sant Kabir Ka Dharma Darshan, A Critical History of Western Philosophy, etc.